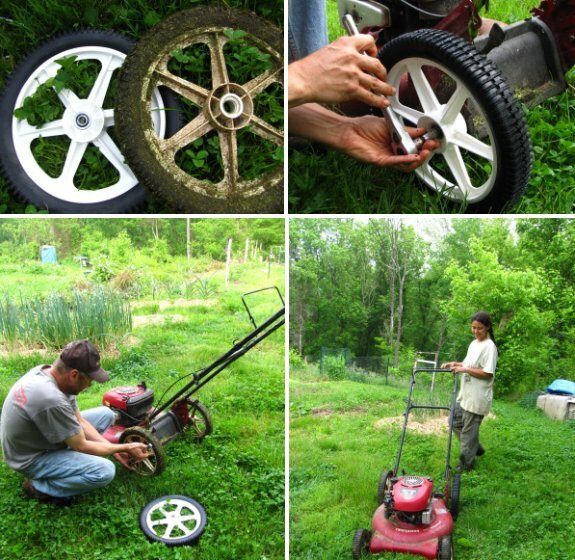 Lawn mower rear wheel conspiracy? The final chapter in my little lawn mower saga is a happy one. A new and improved rear wheel showed up in the mail. What makes this one special is the addition of 2 all metal bearings. Makes me wonder if the original designers planned it this way by making the original wheel without any bearings so they could squeeze another 30 bucks out of the customer when the plastic gives out from a few years of service? "Do not attribute to malice that which is adequately explained by incompetence." Or in this case probably trying to save a few bucks by deleting the separate bearings. A plastic wheel on a metal axle without bearings can work, if it is designed and built right, and in certain conditions. But an outside environment isn't one of them. I hope the bearings in the new wheel are of the sealed type. If you can see balls or rollers inside the bearings, they won't last. I know Mark loves a good conspiracy theory, and this time I'm inclined to agree with him in regard to planned obsolescence. However, we must also remember that their reputation is on the line. If it is a known brand the $30 may not be worth their reputation. If it's just some Chinese crap brand then they probably don't care... Then again, maybe it's just incompetence. Glad it's all fixed up though! Roland --- well put! That's how I feel about most conspiracy theories --- the same results are easier explained through simple human greed. Everett --- good point about the brand. According to their website, Craftsman is "America's most trusted tool brand." And, except for the wheel problem, I've been thrilled with this mower. I can still start it on one tug and it runs beautifully!